In a statement issued Wednesday, the India Meteorological Department (IMD) said 2018 was the sixth warmest year on record, with the average temperature over India being “significantly above normal”. Experts say the increase in temperatures is likely to lead to more extreme weather events. The five warmest years on record (nationwide records began in 1901) were, in order: 2016 (+0.720°C above the 1981-2010 average), 2009 (+0.560°C), 2017 (+0.550°C), 2010 (+0.540°C), 2015 (+0.420°C). The IMD said that 11 of the 15 warmest years were during the recent past fifteen years (2004-18). The trends of recent years are part of the “global warming” trend, Ministry of Earth Sciences Secretary told. “The rate of increase of temperatures over India is almost similar to the global average. The IMD said that the winter and pre-monsoon seasons, with an anomaly of +0.590°C and +0.550°C respectively, “mainly contributed to this warming” seen in 2018. “Mean temperature during the monsoon and post-monsoon seasons (with anomaly of +0.260°C, and +0.310°C respectively) were also above normal,” it noted. According to the IMD, the country-averaged season mean temperatures were also “above average” during all four seasons with winter (January-February, +0.590°C) being the fifth warmest since 1901. The pre-monsoon season (March-May, +0.550°C) was the seventh warmest ever since 1901. The mean monthly temperatures were warmer than normal during all months of the year across the country, except December with mean temperatures exceeding normal by around 10°C during February and March, the IMD said. Apart from the six cyclonic storms that formed over the northern Indian Ocean, India experienced “high impact weather” events, the IMD said. These were extremely heavy rainfall, heat and cold waves, snowfall, thunderstorms, dust storms, lightning and floods. “Uttar Pradesh was the most adversely affected state during the year which reported near 600 deaths due to cold waves, thunderstorm, dust storm, lightning and floods. Flood and heavy rain related incidents reportedly claimed over 800 lives from different parts of the country (viz. northern/northeastern, central & peninsular parts) during pre-monsoon, monsoon & post-monsoon seasons,” the IMD said. The IMD clarified, however, that the casualties mentioned in its statement were based on media and government reports and “same could not be authenticated” from appropriate authorities. The IMD also pointed to high-velocity dust storms and thunderstorms seen in North India in April and May last year and then, later in June-July. 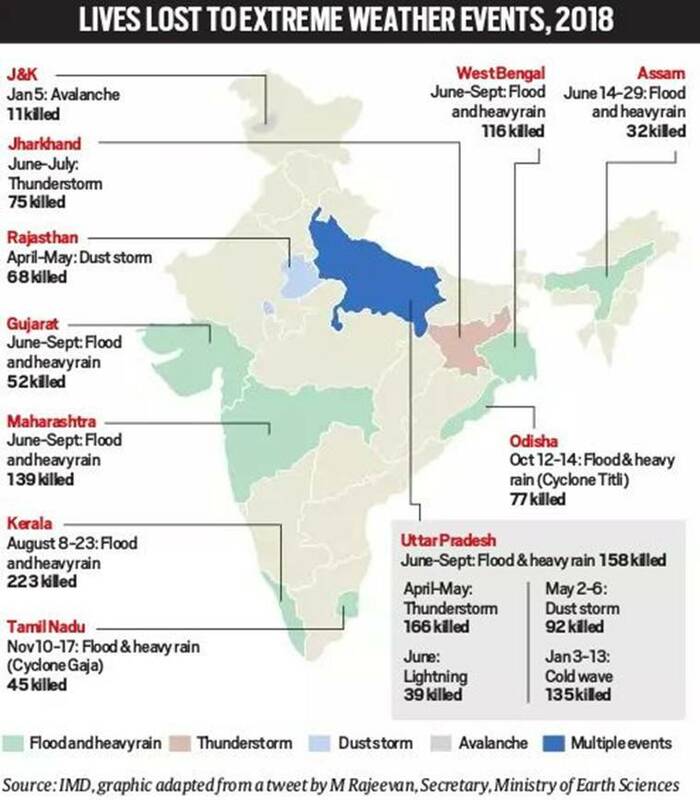 “Thunderstorm was another major event of the year over the northeastern parts of the country which reportedly claimed 166 lives from Uttar Pradesh (April-May) and 75 from Jharkhand (June-July). Dust storm claimed over 150 lives from Uttar Pradesh (92 lives, 2-6 May) and adjoining parts of Rajasthan (68 Lives, April-May),” it said. Rajeevan specifically underlined two extreme weather events: the Kerala floods in August and the thunderstorm activity over the northern states in May-June of 2018. “Kerala floods were due to unusually heavy rains and are very rare over Kerala, which is not conventionally flood prone. The thunderstorm activity also was unique due to prolonged days of activity and severity,” he told The Indian Express. During 2018, six cyclonic storms formed over the northern Indian Ocean, of which three formed over the Arabian Sea and did not make landfall over India. “The remaining three systems, which formed over the Bay of Bengal during the post-monsoon season, crossed Indian coast,” the IMD said. Titli, which formed over the East Central Bay of Bengal on October 8 and crossed the Odisha coast three days later, claimed over 70 lives in coastal districts of the state. Gaja, which claimed 40 lives, formed over the East Central Bay on November 10, crossed the Tamil Nadu coast on November 15 and after moving across the peninsula, re-emerged into Arabian Sea as a deep depression. The last cyclonic storm of the year, Phethai, which formed over South East Bay of Bengal on December 13, crossed the Andhra Pradesh coast four days later, the IMD said. While the rainfall over India as a whole during the southwest monsoon season of June to September was near normal — 90.6% of Long Period (1951-2000) Average — the northeast monsoon season rainfall was substantially below normal (56% of LPA), the IMD said. The latter was the sixth lowest since 1901. “The seasonal rainfall during the northeast monsoon season over the core region of the south peninsula (comprising five subdivisions viz. Coastal Andhra Pradesh, Rayalaseema, Tamil Nadu & Puducherry, South Interior Karnataka and Kerala), was also below average (66% of LPA). Out of these five subdivisions, one subdivision, Kerala, received normal rainfall; the other four subdivisions received deficient rainfall,” the IMD said. Ground Water Extraction Guidelines RIMES terms Titli cyclone ‘rarest of rare’ Do not disturb this Andaman island India’s neglected groundwater crisis Should India have two time zones? Role for CMs in river basin management National Water Grid ‘Beast from The East’ – the science behind Europe’s Siberian chill The river-linking plan Why hunger in India is worse than in Nepal?